FILE - Police run toward the scene of a shooting near the Mandalay Bay resort and casino on the Las Vegas Strip in Las Vegas, Oct. 1, 2017. 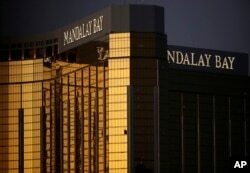 FILE - In this Oct. 3, 2017, file photo, windows are broken at the Mandalay Bay resort and casino in Las Vegas, the room from where Stephen Craig Paddock fired on a nearby music festival, killing 58 and injuring hundreds on Oct. 1. "We heard the automatic rifle fire,'' Jones said, adding in a transcribed statement that his officer body-worn camera was recording when he arrived to find concertgoers fleeing the Route 91 Harvest Festival grounds across the street from the hotel. Weekly releases of police records to the media have continued under court order in a public records lawsuit by media organizations including The Associated Press. The material has included clips of nearly 1,200 officer body camera videos, many hours of 911 audio recordings, and dozens of handwritten and transcribed witness accounts.